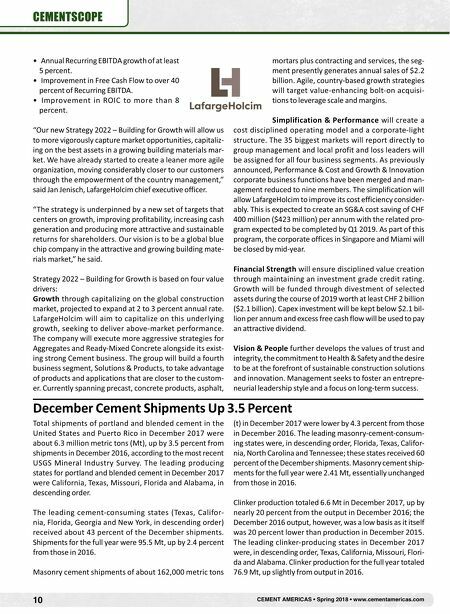 10 CEMENT AMERICAS • Spring 2018 • www.cementamericas.com CEMENTSCOPE • Annual Recurring EBITDA growth of at least 5 percent. • Improvement in Free Cash Flow to over 40 percent of Recurring EBITDA. • Improvement in ROIC to more than 8 percent. "Our new Strategy 2022 – Building for Growth will allow us to more vigorously capture market opportunities, capitaliz- ing on the best assets in a growing building materials mar- ket. We have already started to create a leaner more agile organization, moving considerably closer to our customers through the empowerment of the country management," said Jan Jenisch, LafargeHolcim chief executive officer. "The strategy is underpinned by a new set of targets that centers on growth, improving profitability, increasing cash generation and producing more attractive and sustainable returns for shareholders. Our vision is to be a global blue chip company in the attractive and growing building mate- rials market," he said. Strategy 2022 – Building for Growth is based on four value drivers: Growth through capitalizing on the global construction market, projected to expand at 2 to 3 percent annual rate. LafargeHolcim will aim to capitalize on this underlying growth, seeking to deliver above-market performance. The company will execute more aggressive strategies for Aggregates and Ready-Mixed Concrete alongside its exist- ing strong Cement business. The group will build a fourth business segment, Solutions & Products, to take advantage of products and applications that are closer to the custom- er. Currently spanning precast, concrete products, asphalt, mortars plus contracting and services, the seg- ment presently generates annual sales of $2.2 billion. Agile, country-based growth strategies will target value-enhancing bolt-on acquisi- tions to leverage scale and margins. Simplification & Performance will create a cost disciplined operating model and a corporate-light structure. The 35 biggest markets will report directly to group management and local profit and loss leaders will be assigned for all four business segments. As previously announced, Performance & Cost and Growth & Innovation corporate business functions have been merged and man- agement reduced to nine members. 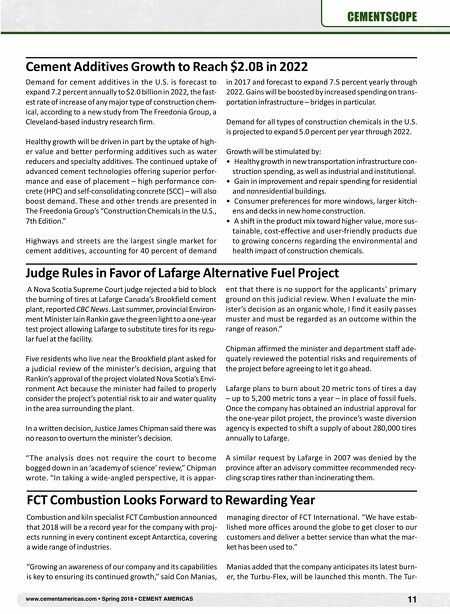 The simplification will allow LafargeHolcim to improve its cost efficiency consider- ably. This is expected to create an SG&A cost saving of CHF 400 million ($423 million) per annum with the related pro- gram expected to be completed by Q1 2019. As part of this program, the corporate offices in Singapore and Miami will be closed by mid-year. Financial Strength will ensure disciplined value creation through maintaining an investment grade credit rating. Growth will be funded through divestment of selected assets during the course of 2019 worth at least CHF 2 billion ($2.1 billion). Capex investment will be kept below $2.1 bil- lion per annum and excess free cash flow will be used to pay an attractive dividend. Vision & People further develops the values of trust and integrity, the commitment to Health & Safety and the desire to be at the forefront of sustainable construction solutions and innovation. Management seeks to foster an entrepre- neurial leadership style and a focus on long-term success. December Cement Shipments Up 3.5 Percent Total shipments of portland and blended cement in the United States and Puerto Rico in December 2017 were about 6.3 million metric tons (Mt), up by 3.5 percent from shipments in December 2016, according to the most recent USGS Mineral Industry Survey. The leading producing states for portland and blended cement in December 2017 were California, Texas, Missouri, Florida and Alabama, in descending order. The leading cement-consuming states (Texas, Califor- nia, Florida, Georgia and New York, in descending order) received about 43 percent of the December shipments. Shipments for the full year were 95.5 Mt, up by 2.4 percent from those in 2016. Masonry cement shipments of about 162,000 metric tons (t) in December 2017 were lower by 4.3 percent from those in December 2016. The leading masonry-cement-consum- ing states were, in descending order, Florida, Texas, Califor- nia, North Carolina and Tennessee; these states received 60 percent of the December shipments. Masonry cement ship- ments for the full year were 2.41 Mt, essentially unchanged from those in 2016. Clinker production totaled 6.6 Mt in December 2017, up by nearly 20 percent from the output in December 2016; the December 2016 output, however, was a low basis as it itself was 20 percent lower than production in December 2015. The leading clinker-producing states in December 2017 were, in descending order, Texas, California, Missouri, Flori- da and Alabama. Clinker production for the full year totaled 76.9 Mt, up slightly from output in 2016.